Israeli Prime Minister Benjamin Netanyahu addresses the U.N. General Assembly in New York, visual in hand, revealing a hidden Iranian nuclear facility and secret missiles in Lebanon’s capital, on Sept. 27, 2018. Photo by Avi Ohayon/GPO. 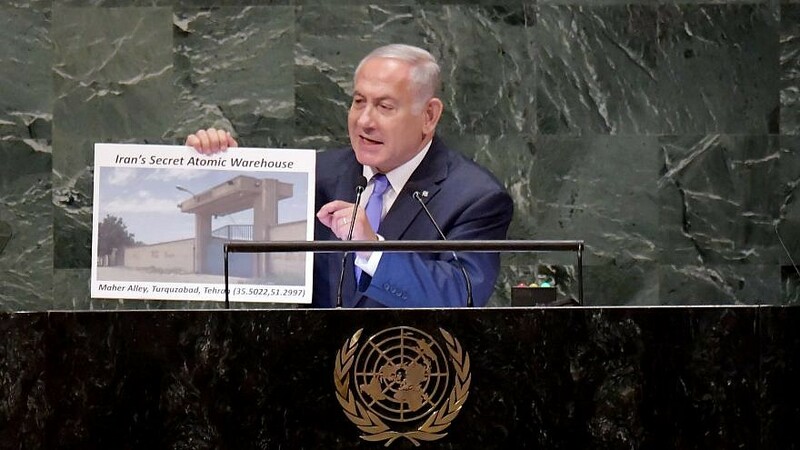 Netanyahu, in a speech at the United Nations in September, called on the IAEA to examine the site, claiming that it housed 33 pounds of “unspecified radioactive material that had since been removed,” according to Reuters. The prime minister said that the warehouse exemplified that Iran seeks to create a nuclear bomb, despite the 2015 agreement that sought to slow down the nuclear program in exchange for sanctions relief. One of the diplomats said the IAEA was at the location more than once last month. The IAEA declined to comment to Reuters.